This walk: 2010-8-5. Dean Burn Ford and clapper bridge, ancient trees, Abbot's Way, Water Oak Corner, Avon Reservoir, Brockhill Ford, cairn circle & cist, fox moth caterpillar, oddities, Huntingdon cross, wheel pit, pale-flowered cross-leaved heath, soft shield fern, Mattins Corner, Keble Martin's chapel, cross, Huntingdon Warren farm, Western Wella Brook clapper bridge, Dartmoor submarine, sycamore tree, Heap of Sinners, Huntingdon Barrow, gert, Pupers Rock, IHS, Outer Pupers, Inner Pupers, pineapple weed, BAT stone. Walk details on Page 2 - Information about the route etc. 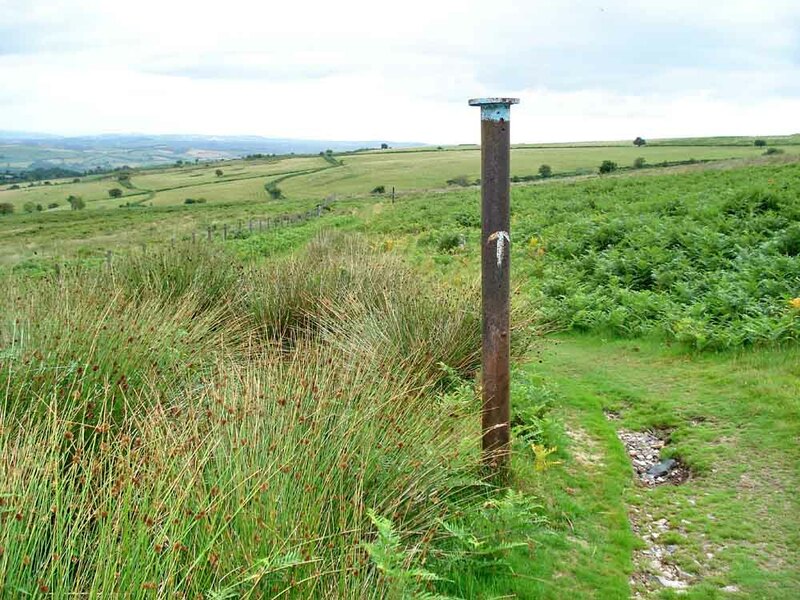 This walk was based on Exploration 5: Cross Furzes, The Abbot's Way, Huntingdon Warren & Puper's Hill in F.H. 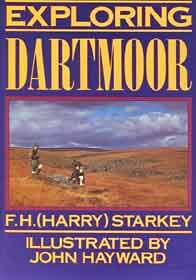 (Harry) Starkey's Exploring Dartmoor. 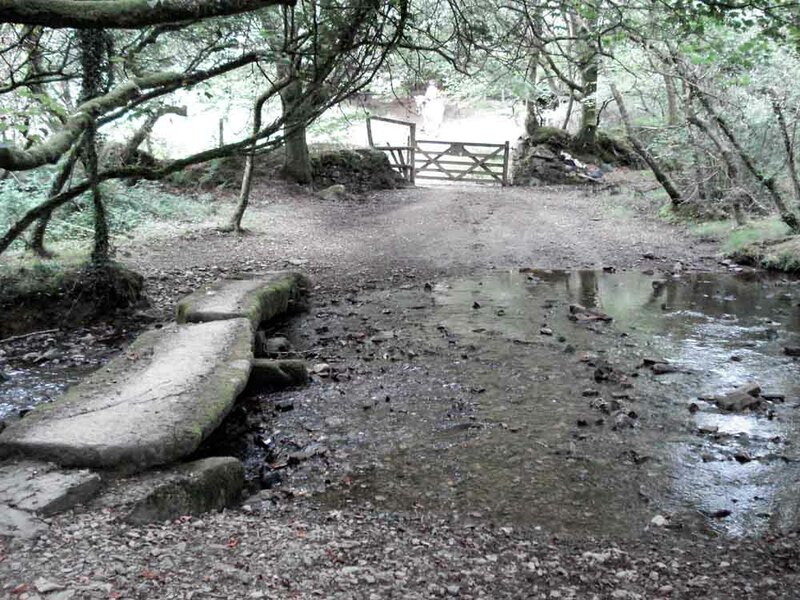 Dean Burn Ford and clapper bridge at SX 6980 6653, at the bottom of the steep, rocky lane down from the car park that is the start of the Abbot's Way, near the Cross Furzes junction. 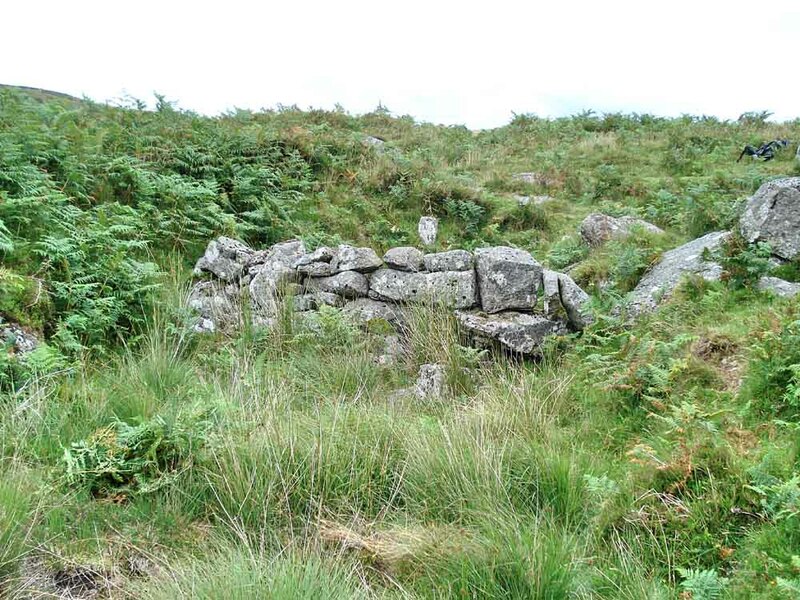 The gate to go through can also be seen, leading to Water Oak Corner where we get onto the open moor. 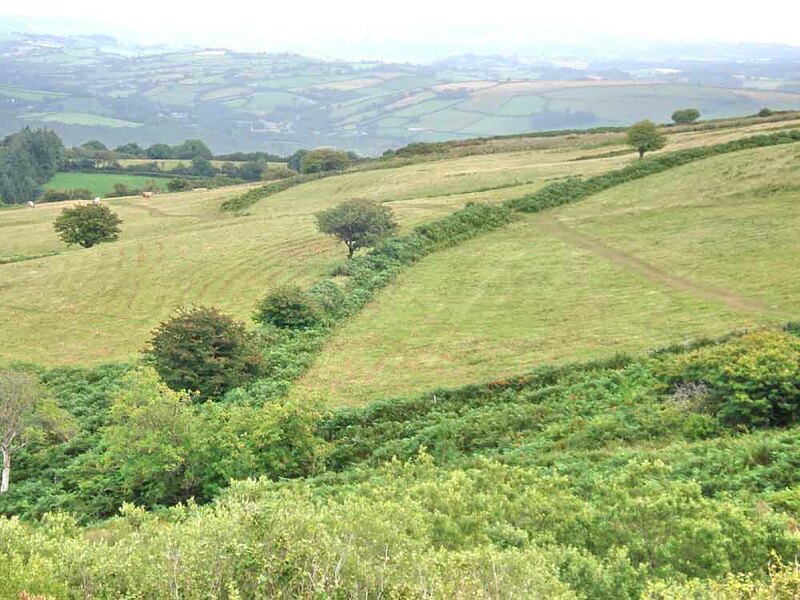 The medieval monks and abbots came through here on their travels between Tavistock, Buckland and Buckfast Abbeys, prior to this name it was known as the Jobbers' Path, being used by the wool jobbers who carried wool across the moor on packhorses. There are some ancient trees in this area, I neglected to identify them ..... 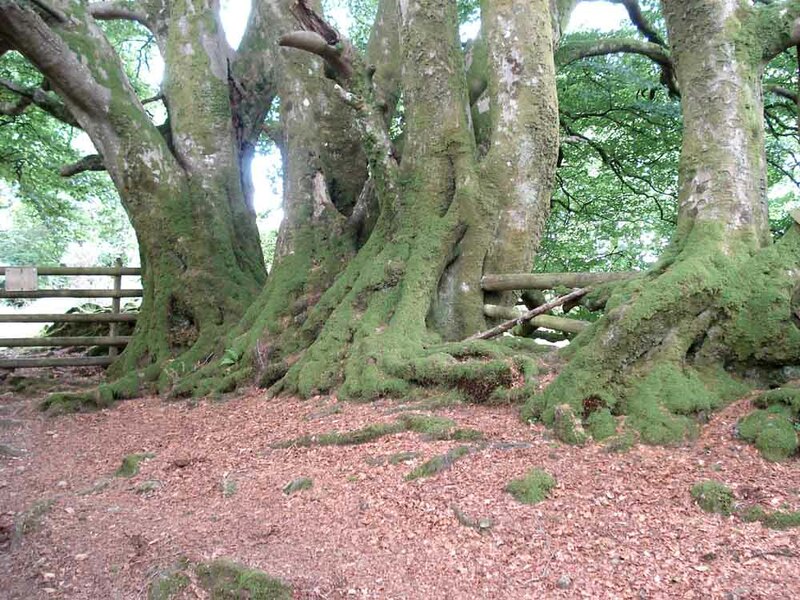 I'll do that another time ..... common beech, see here. As previous photo, 200 years old? 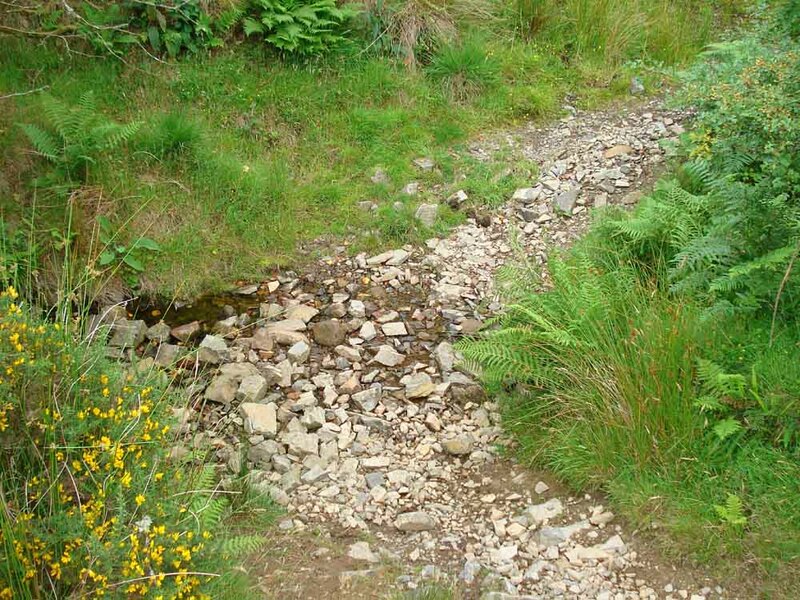 The stream to be crossed at SX 68905 65918, with very little water. Also, marked near the end of this section by two pieces of Ark Royal (RO9) steam pipe, complete with the government arrow mark, I was told! The other piece of Ark Royal steam pipe can be seen across this field, near the centre of the photo. Water Oak Corner, at SX 68598 65983. 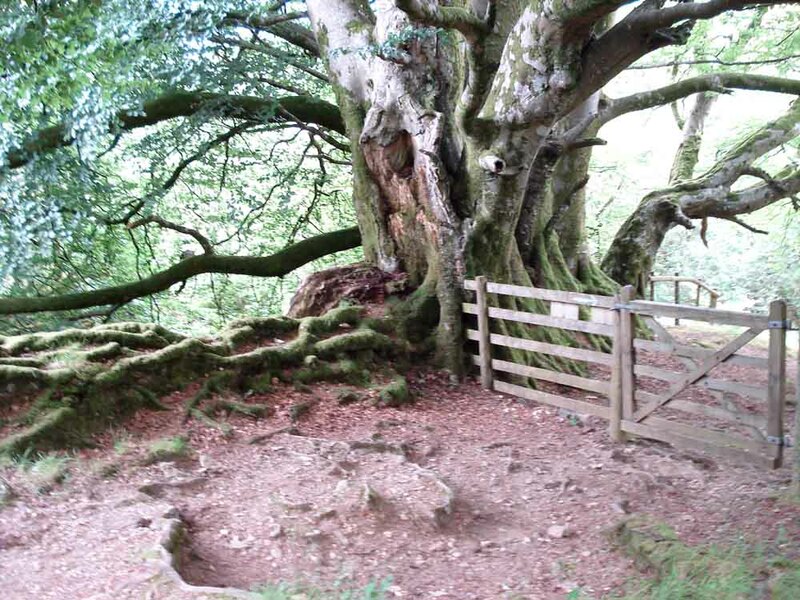 Starkey describes this spot thus: "There are no oak now, only beech, pine and silver fir" (published 1980, 2nd edn. 1988). 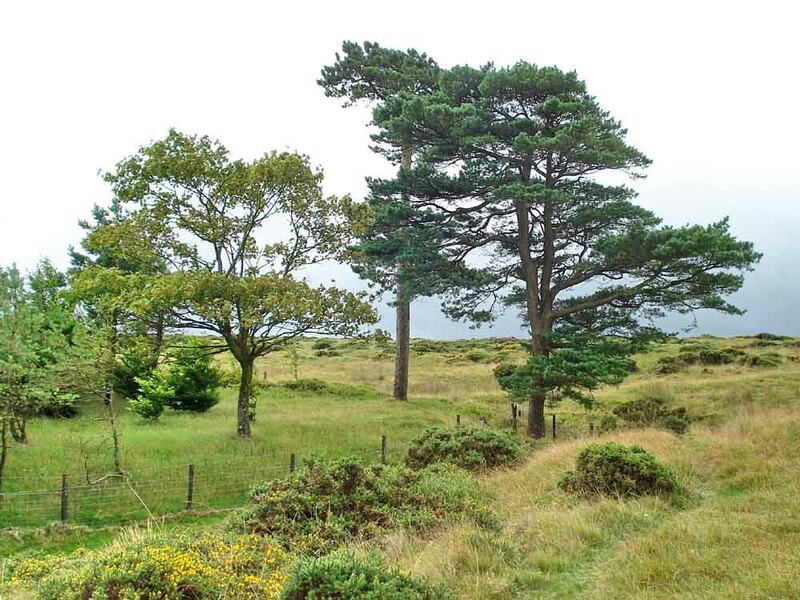 Perhaps these two Scots pines are from then. The smaller tree is a sycamore, with a stand of nearby birch and then a lot of recent conifers out of sight, on the left. 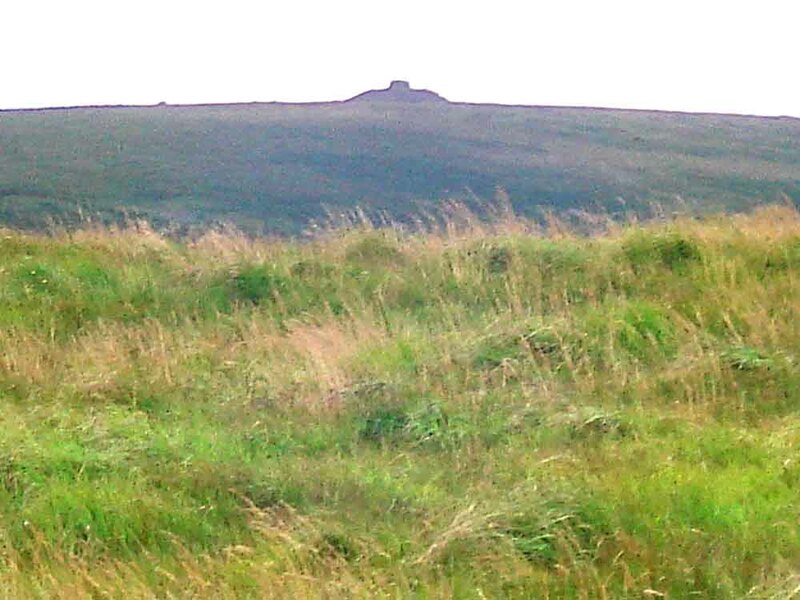 The "Dartmoor Submarine" - a zoomed view to Eastern White Barrow from the top of Dean Moor. 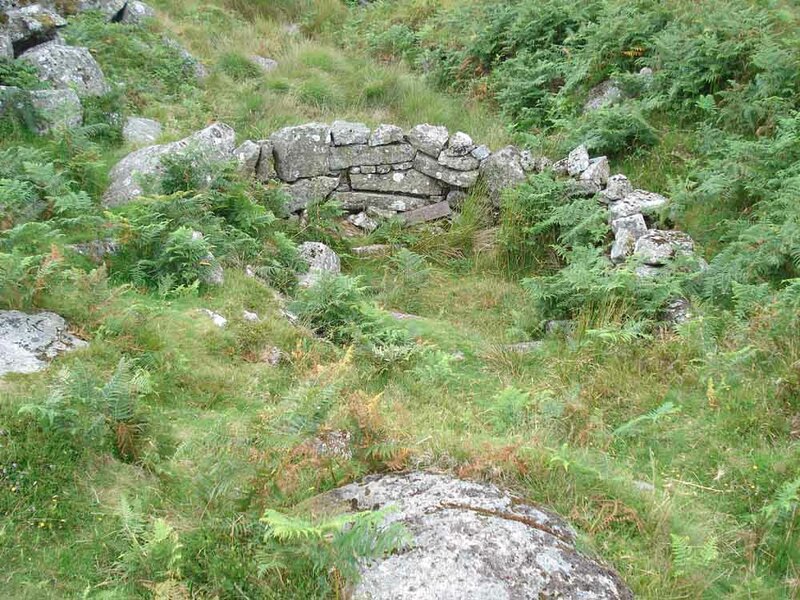 This elaborate cairn was visited on 8th July 2010. 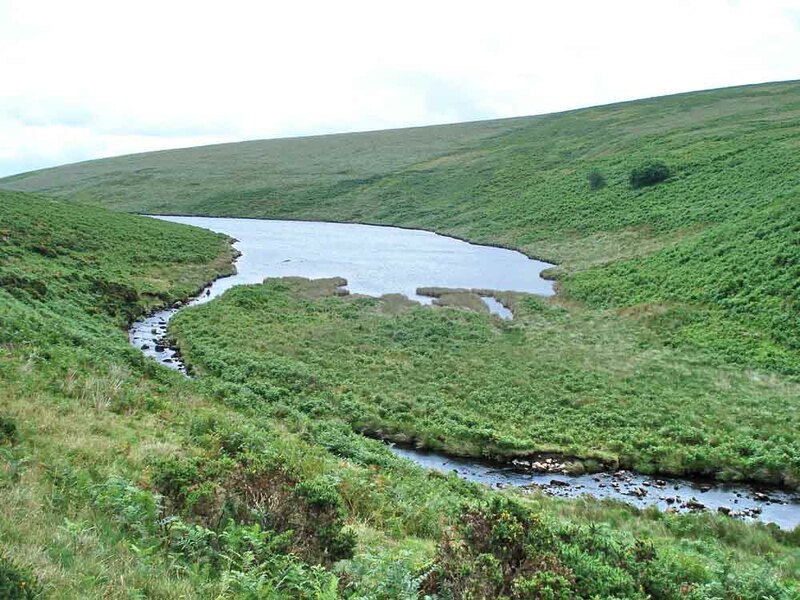 The Avon Reservoir, completed 1957, a view from the Abbot's Way while descending to Brockhill Stream. Brockhill Ford, SX 67905 65793. 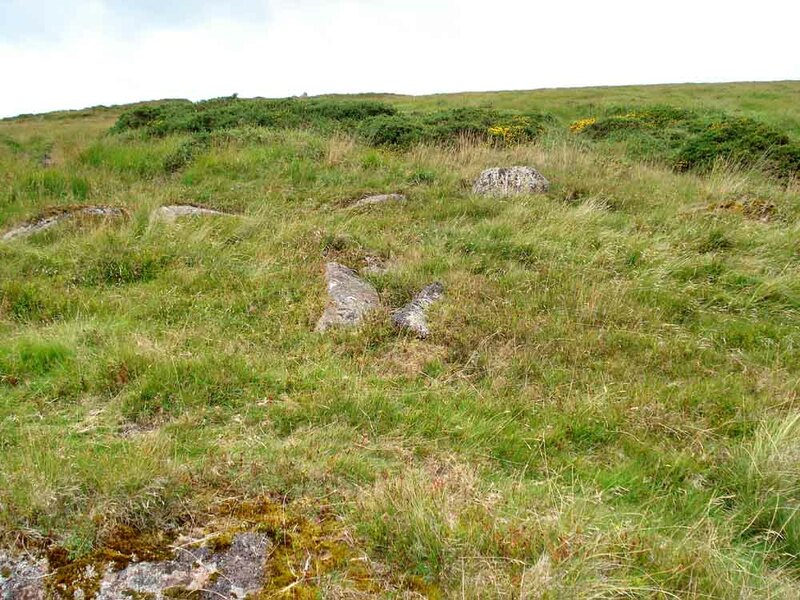 The cairn circle and cist, the two long slabs of the cist are near the centre of the photo. 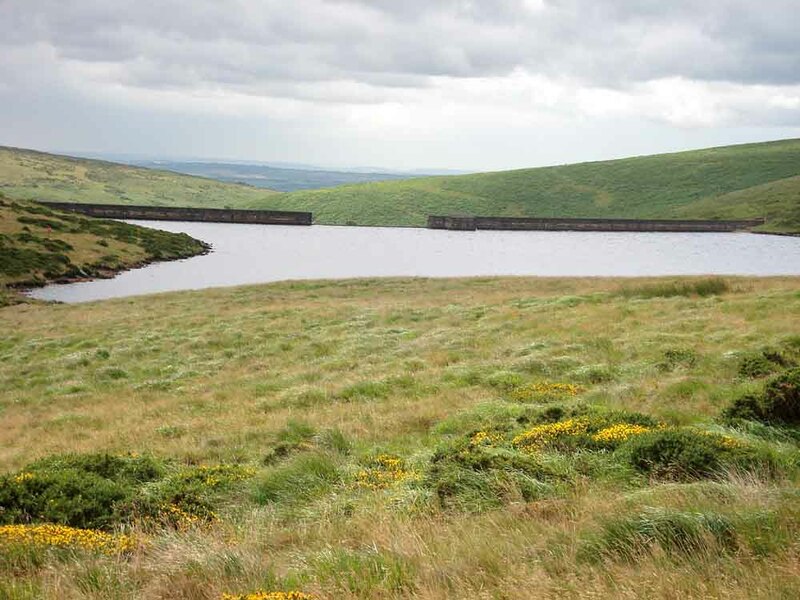 Another view of the Avon Reservoir, showing the wall of the dam and the central spill-way. 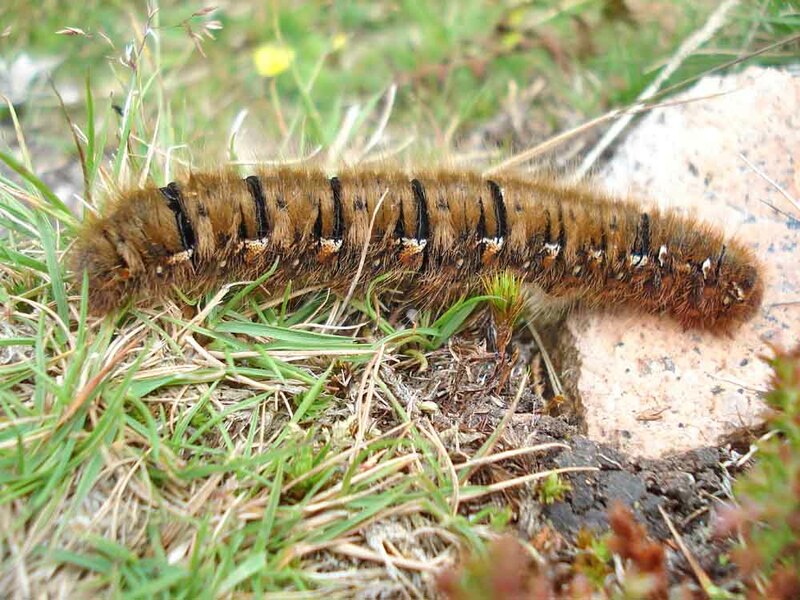 Fox Moth caterpillar (July-October), about 8 cm / 3 inches in length. 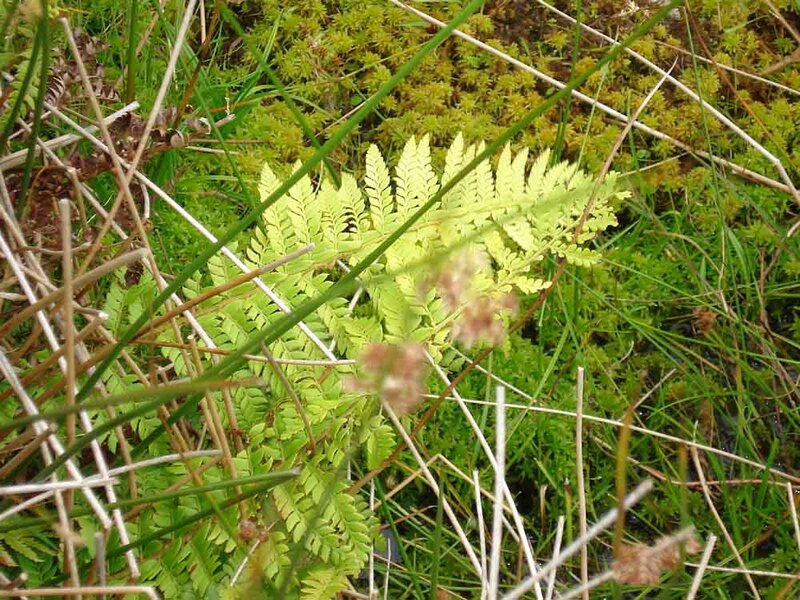 Heather, bramble, and bilberry are among its foodplants. It will be fully grown by the autumn. It will then hibernate, to emerge next spring without feeding, pupate in March/April and be on the wing in May. Click here for: a photo of an adult. A view of the Avon Reservoir from a point near Huntingdon Cross, where the River Avon flows into the lake. 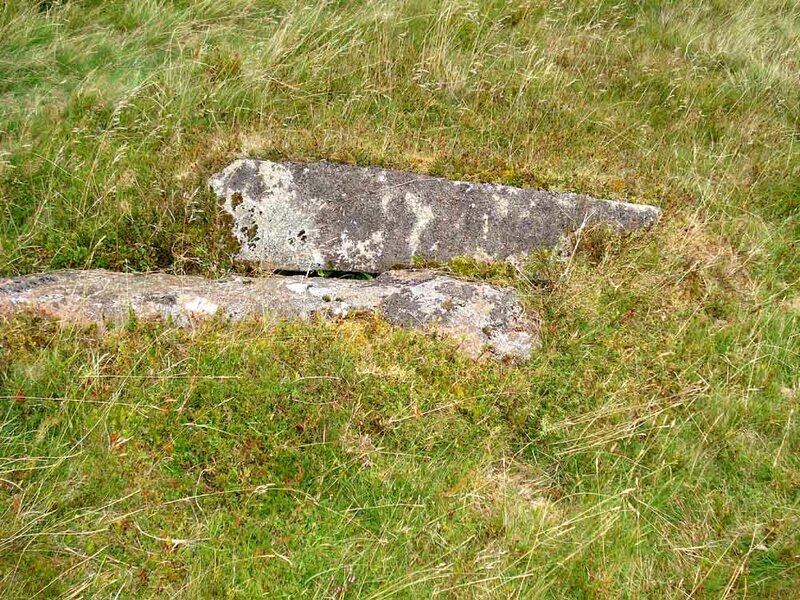 A Dartmoor oddity: a piece of what appears to be iron railway embedded in the ground alongside the track at SX 66825 65993. There were about seven or eight such pieces close together. Either side of the Avon, they appear to be built to withstand force from the right, upstream ..... 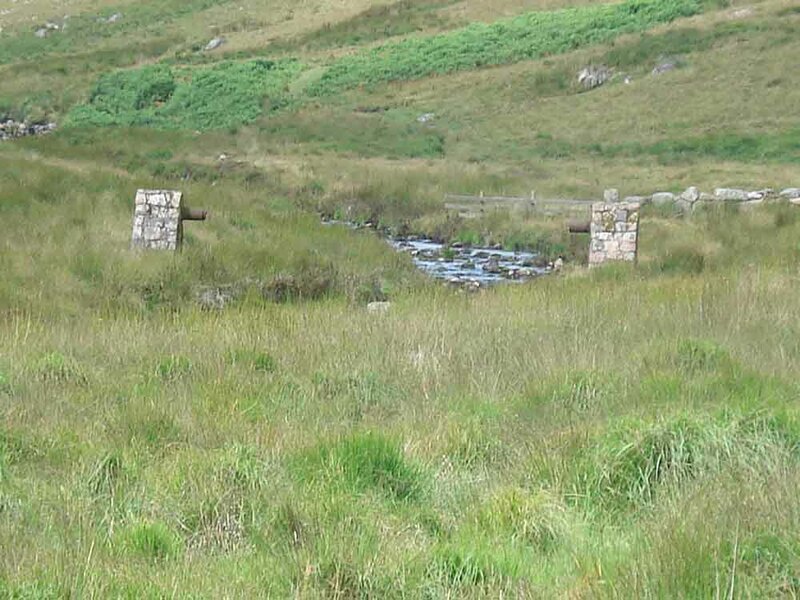 Someone has now kindly told me: "The stone pillars on the Avon a little way downstream from Wella Brook Foot, whilst not remotely interesting in themselves, may prompt casual enquiries from walkers as to their (former) purpose. 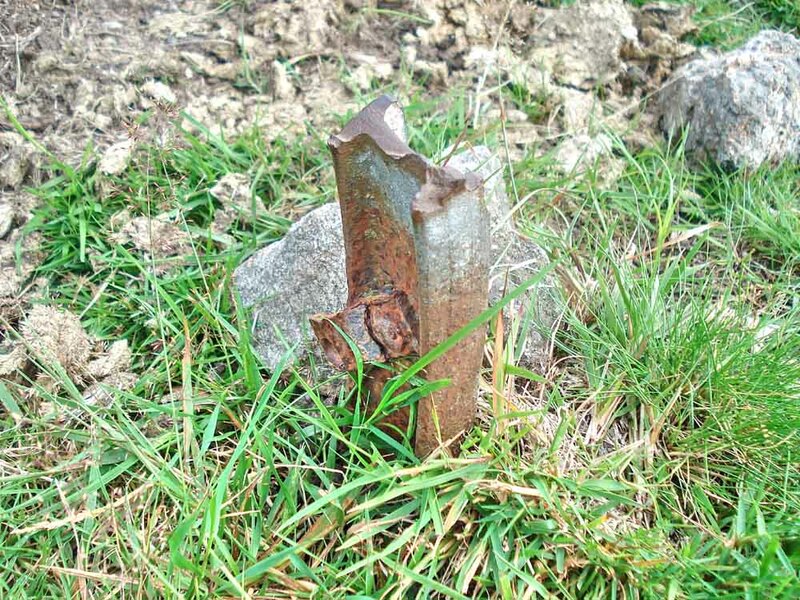 They are in fact the remnants of a reservoir boundary fence which was dismantled some years ago � aside from the section around the quarry from which stone was taken for the building work (q.v. grid square 6864) � the line of which is still marked on the O.S. Outdoor Leisure Map 28." 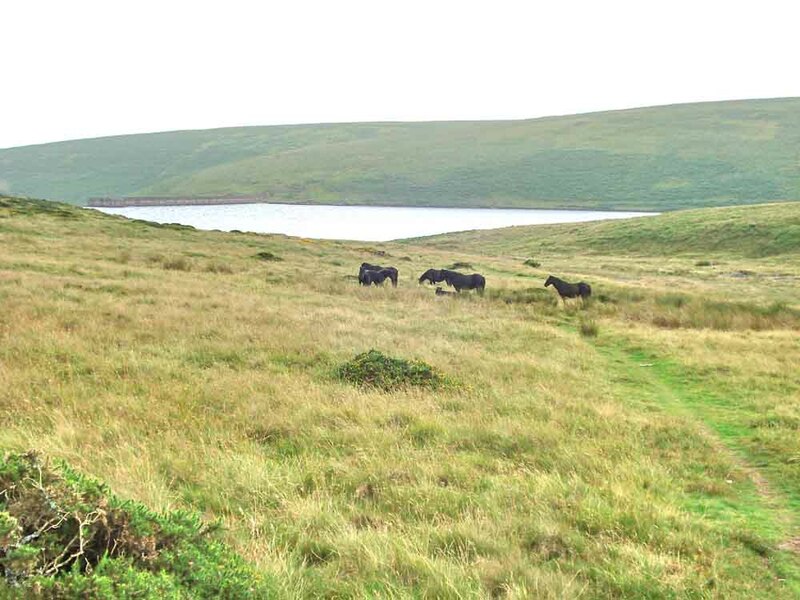 - from Mike Brown's Guide to Dartmoor CD. 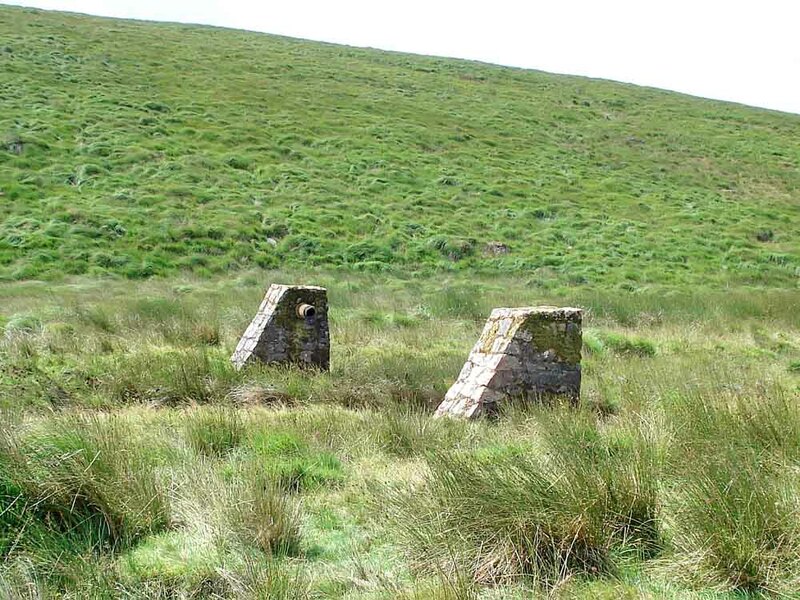 Something to do with sluicing or controlling water flow when the dam was being built, perhaps? Another use of the old Ark Royal steam pipes? Looking east - it was a squeeze to get between the wall and the cross, in fact, the camera hand was resting on the wall. 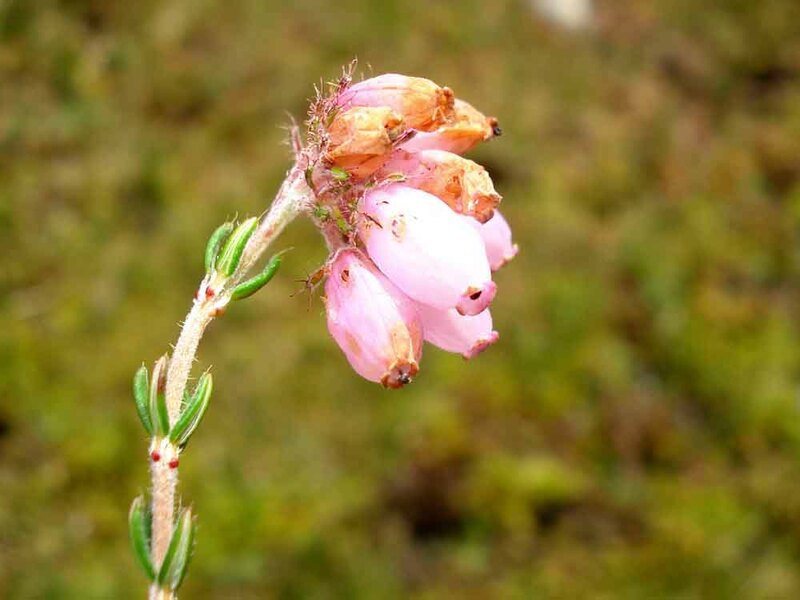 A very pale variety of cross-leaved heath, Erica tetralix. 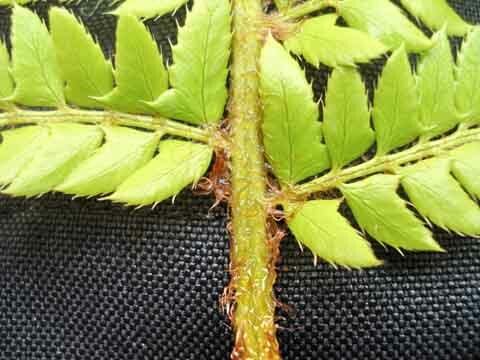 Pinna, removed from main stalk, rachis (small section remaining at left), showing the basal pinnule on the side towards the frond tip (at top of image) is larger than its neighbours with the angle onto the stalk being at least a right angle ..... 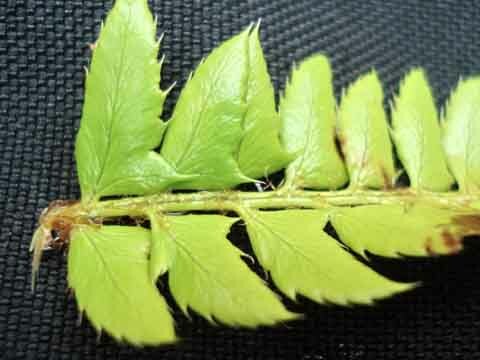 Section of the main frond with pinnae to left and right, covered in scales and hairs. Showing the scale of the wheel pit, which probably housed a 40-foot water wheel. How did they get it here? 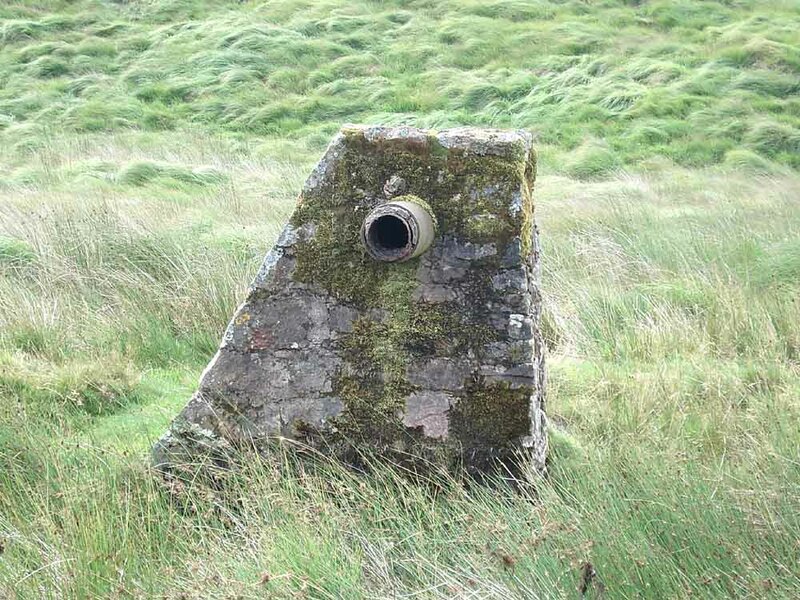 The "Dartmoor Submarine" can still be seen on the sky line. Matins Corner - a first view of Keble Martin's chapel, at SX 66631 66607, when walking up the valley from the cross. Keble, Arthur and Jack were the sons of Revd. Martin of Dartington. 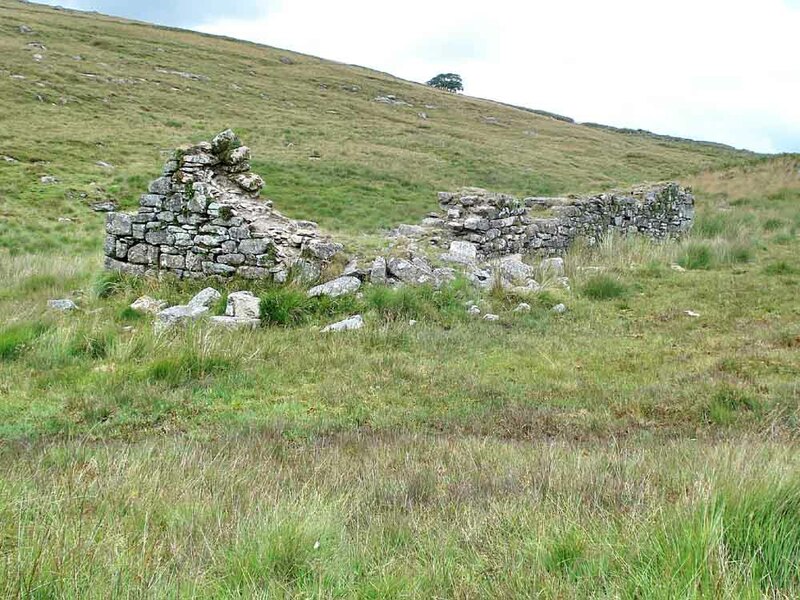 The sons, their cousins and friends would camp here in summer from 1904 until at least 1913, and built the chapel for their own worship in 1909. 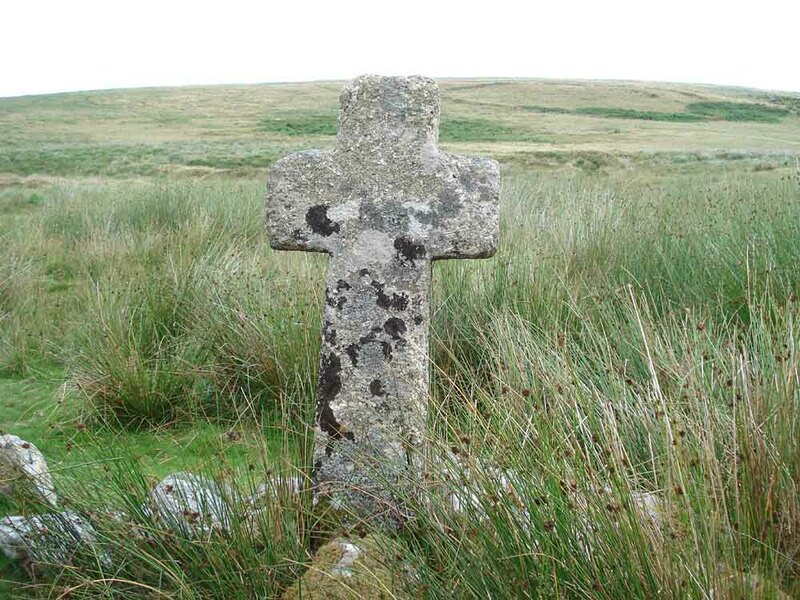 The cross was inscribed by Arthur. Both Jack and Keble became parsons; Arthur became an architect. Keble Martin spent the next forty years producing The Concise British Flora in Colour, 1st Edition 1965. 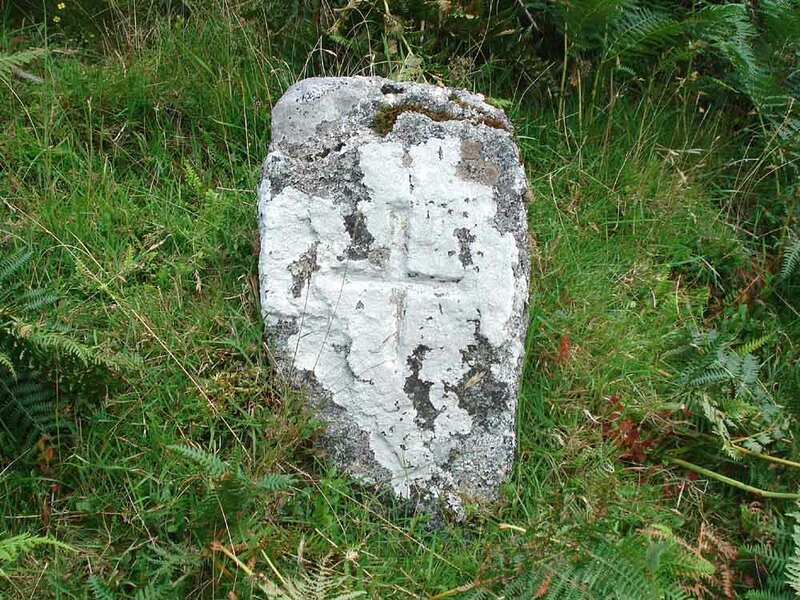 The standard grid reference is SX 666 666. With 666 being "the number of the beast", one has to wonder if this site was chosen specifically with that in mind as an act of defiance. However, the grid reference is mystifying because the standardised national grid system came into use some time after 1938 although the question of having a reference system had been considered since 1881 and a British Grid System was used on military maps from 1919 - but the chapel was built in 1909. Is it a coincidence? If anyone has evidence that they knew the grid reference, please email me. 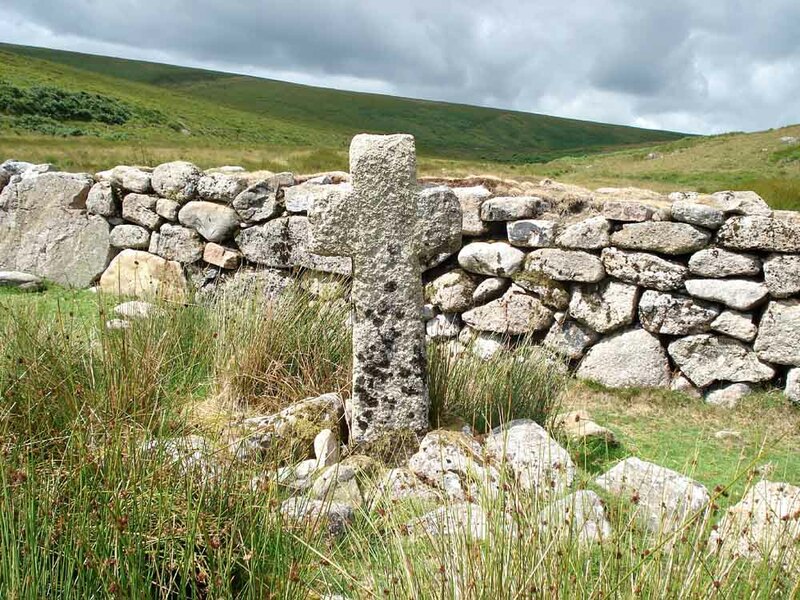 A view within the small chapel - we were unable to locate the Chi-Rho stone embedded in the ground, mentioned on this page (of the Dartmoor Crosses web site). 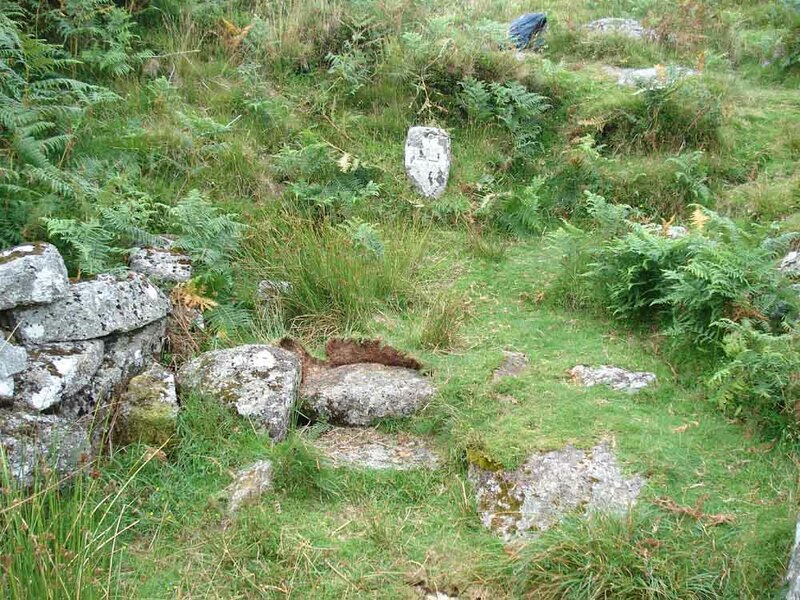 It is now revealed - see here, 31st Aug 2010, although not with such clarity as the Dartmoor Crosses photograph. The notice bears the date 1904. 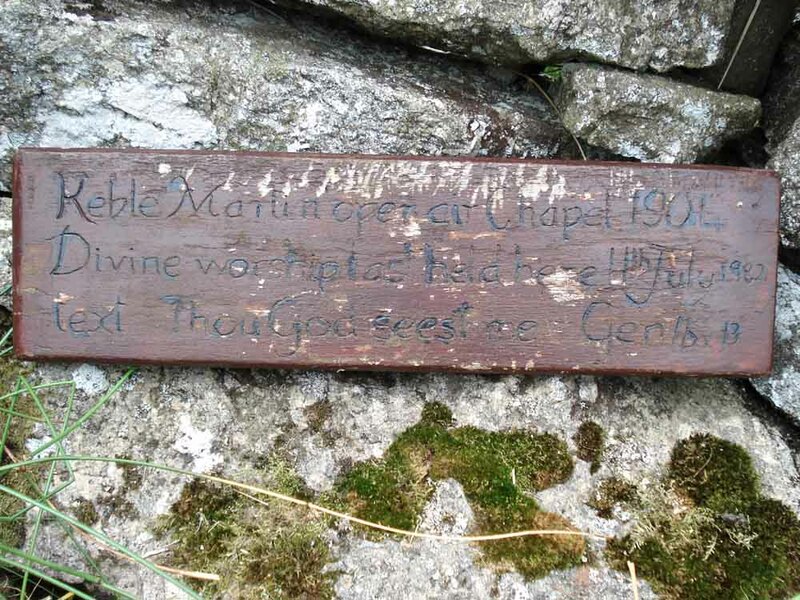 Their written diary records that they camped here in the summers during 1904-1913, with the chapel being built in 1909. 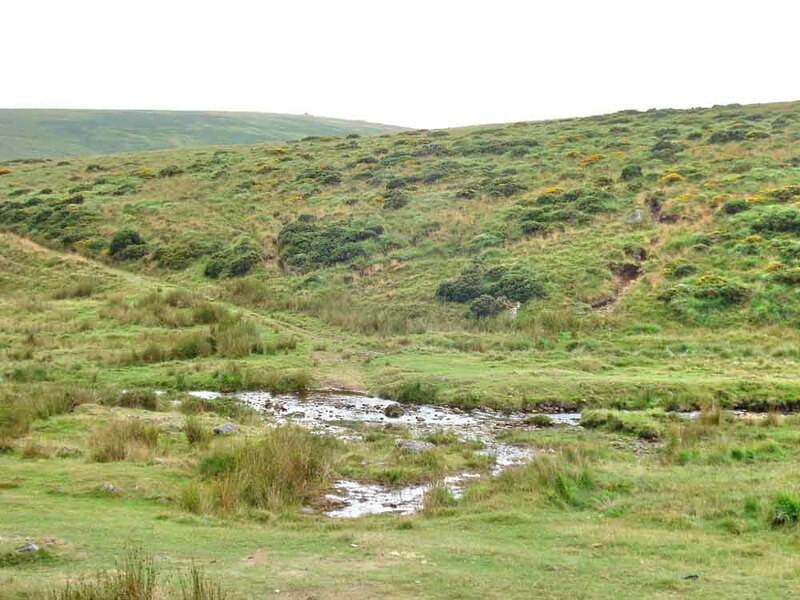 A marriage between two Dartmoor letterboxers was blessed here the day following the main service in Newton Abbot Registry Office on 12th May 1990, the photo on the Legendary Dartmoor link shows at least forty-nine persons present! They had another short service here on their 10th anniversary. I�ve just been reading your web page about Keble Martin chapel and the Blessing of our marriage in 1990. Please could you correct the name of my husband which is Derek (not Martin!). 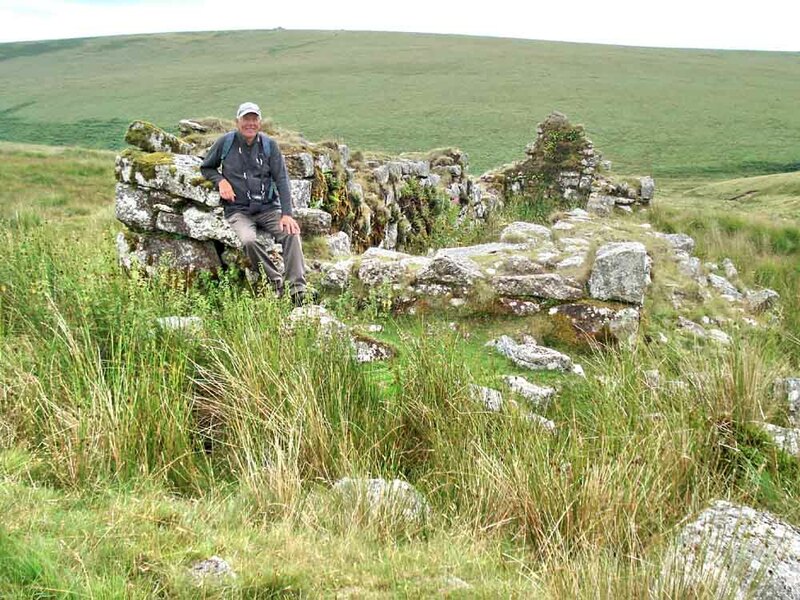 For the record we actually met at the Ten Commandments on Buckland Beacon on 2nd May 1988, whilst we were both letterboxing. We are both still letterboxing and still married! We went back out to the Chapel on our 10th Wedding anniversary and had a short service with Eric Carless officiating again. Caroline Atchley and Derek Newman.